This is not Laurie's photo! This photo is from ABC News. 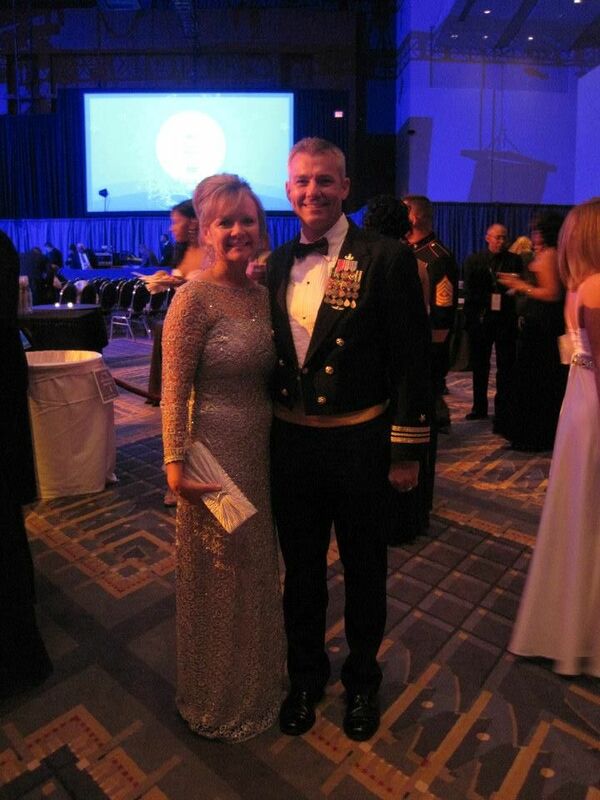 My friends, Rob and Laurie got to go to the Inaugural Ball. I was living vicariously through them and I thought maybe you all would enjoy hearing their adventure. I told her to take a lot of photos, but their camera died! You will just have to use your imagination. Okay, let me preface this by saying that I have never blogged before. 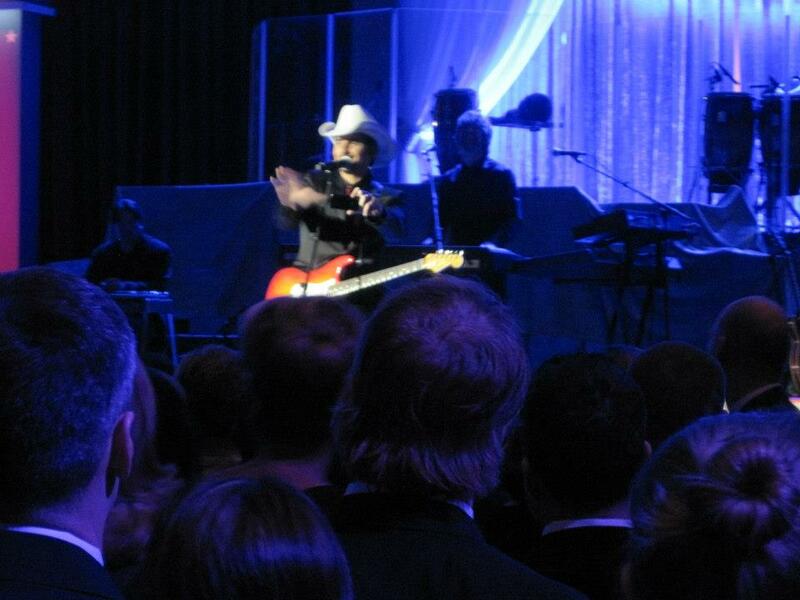 Teresa asked me to write about our Inaugural Ball experience for her new Blog series. As with anything else in our life, there is a lot to write about, I'll try and keep it as short as possible. Based on my first paragraph, this may not go well. 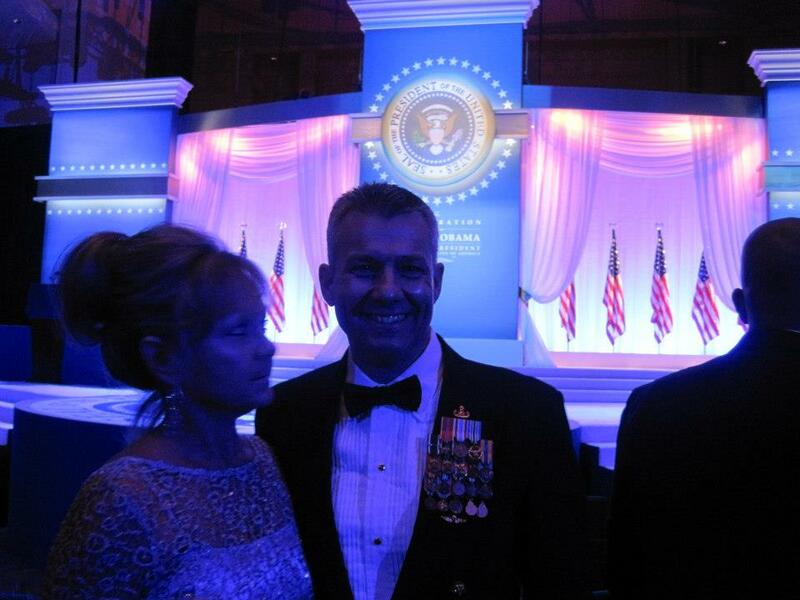 My husband, Rob, works at the Pentagon. One day at work, someone came up to him, leaned in and quietly asked him if he'd be interested in going to the Inaugural Ball. The guy explained that there are only so many slots and not everyone asked in this first process will be selected to go. So, we said "sure," I mean what are the chances that "we" would be selected to go. Not sure how the process works, but it's obvious that the person making that decision didn't know us from Adam. Two days later (and already forgotten about by us), Rob gets an e-mail that starts off with CONGRATULATIONS!! He is wondering what for?? You guessed it, we were selected to attend a ball that we never really had any intentions of going to when we said, "Sure, why not". Aaaccck! I now basically have 10 days to buy a gown and feel totally under the gun. I'm not built for gowns and when I say I would rather go swim-suit shopping, I'm not kidding. When the sales lady brought me two gowns and said, "Here are two styles that flatter every figure", I knew this was going to be depressing. I walked out and stared at her with my "I told you so" face. She looked me up and down and replied, "Well, you're just a little more challenging is all". THAT'S what I needed to hear. I ended up ordering 2 gowns (same gown, 2 different sizes) from Nordstrom's website. Less than a week before the ball, I receive the box. I open it up and find 2 different gowns, not the ones I ordered. I call Nordstrom's and after a few phone calls back and forth, I learn that they no longer carry that dress and the photo on their website is incorrect. Panic. I'm running late to get my hair done so I decide if my hair turns out terrible, it's a sign from God and I'm not going at all. Well, it didn't exactly turn out good, but I can't say it was terrible either, so off to the mall I go. I find a gown at Macy's that I can get by with, but now I need new shoes and a clutch to match it. This is turning into way more than I bargained for. By Friday, I have what I am willing to 'make-do' with. Pretty much over it by this point. Oh, I forgot the transportation fiasco! In the midst of the dress fiasco, we find out that we aren't supposed to drive to the ball, that many of the roads will be closed and there isn't any parking. After 3 hours of calling all over the place looking for the cheapest ride we can get, we go with the first place we called. It didn't sound quite as expensive as it originally did...lol. I won't even tell you what we had to pay. I still get a little ill just thinking about it. The day of the ball I start getting ready early, because I know how my life goes. Something is bound to go wrong. I'm pleasantly surprised that things seem to be rolling along quite well other than I have a headache. Well, scratch that thought. I put my dress on (the liner) and I hear a snap. My strap busted. Once again, panic. My husband brings me a 3-inch long safety pin to use (keep in mind that the outside of the dress is full of holes so you will be able to see whatever I use to reattach the strap). I said in a very calm whisper, "ARE YOU KIDDING ME??!!!! I can't use that"!!! I'm rifling through drawers, contemplating stapling it, that's right, I thought about using a stapler on my gown, you read that correctly...then I remembered I had these pins for shirts or dresses that are too low, they have a frog pin on them with fake jewels. Perfect, put one on each strap and it looked like part of the gown. Okay, maybe not 'perfect', but it worked. Oh no, I just scrolled back through and it's already too long and I'm not even at the ball yet!!! Okay, fast-fwd. We have to walk a distance to get to the line for security. Did I mention that it is outside and it is cold?? My legs and feet are bare and they're cold. Oh, listen, someone is singing, free entertainment for us waiting in line. Not quite! Protestors. I looked at Rob and said, "What are we doing here? Call the driver back. I'm ready to go home and we aren't even inside yet". They were yelling about Killer Drones and the war. My husband said to everyone within ear shot of us, "Don't say anything, they're just looking for a reaction". And less than 20 seconds later, he yells to them (oh, the irony), "You're at the wrong place, you need to go down a few blocks and stand in front of the big, white house and sing your Killer Drone songs to them. Because I'm here to tell you that there isn't a one of us in this line that can do anything about the war!" Well that got us all laughing which passed the time until we got up to the metal detectors. speaking of metal--look at Rob's metals! Once inside we were directed to the room for the ball we were attending. It was a bit of a jaunt. I decided at the last minute that I was going to check my coat so we stroll over to the closest coat check. Keep in mind that there are a lot of people there with real fur coats...a lot. Needless to say, I'm not one of them. I lean over to the 4 ladies behind the table and say, "You keep an extra close eye on that thare QVC faux-fur Dennis Basso jacket, you hear?" And I give my one-finger jab with a click of my tongue and a wink. Thankfully, they got my joke and we had a big ol' belly laugh. Which is, I must add, one of my favorite moments of the evening because I love people to think I'm funny. I own it. This is going to sound a little ungrateful, but we were a little underwhelmed. A buffet?? Really? No tables? Okie-dokie. It's a little hard for Wounded Warriors to make their way through a buffet but I guess money had to be cut somewhere. Anyway, the food was Italian and pretty tasty if I do say so myself. So we ate, mingled, took a couple of photos and were heading out to scope the Convention Center out better because I was bored. We were stopped by the door-guards that said, "You don't want to leave right now" to which I replied, "Um, yes I do". My husband understood what they were trying to say so he said, "ETA?" and they said, "Less than 30 minutes". Well, it didn't take me long to figure out what they were saying. Okay, so it did, but I still understood by the end of the conversation, the POTUS and First Lady were going to arrive soon and for some reason, the guards were quite concerned that we not miss it. Other people were leaving and they weren't stopped, but I guess we looked like we really needed to be there for some reason! So we got our spots and went to take another picture and, blip, the camera shuts off by itself and says the battery is dead. Alecia Keyes(sp) came out and started to sing and the crowd went crazy and started pushing and crowding us. Someone had BO, someone smelled like smoke and my husband thinks someone might have been overcome with excitement and we'll leave it at that. I had to get out of the crowd, it was too much for me so we fought our way to the back. 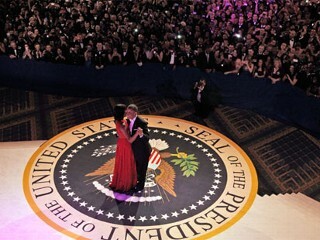 We could still see the President and First Lady well enough from where we were. I must say, she looked beautiful, much more so than the pictures and TV show. The President looked older to me than he does on TV. I leaned over to Rob and said, "I think he's the only person in the room that can give you a run for your money with the grey hair". I did have a 'moment' standing there in that room knowing it will probably be the only time in my life that I would be in the same room as the President of the United States. Okay, that passed and I was bored. I wanted to go to the other ball. So, I befriended some guards and told them I wanted to crash the other ball. I promised I wouldn't name names and if we were arrested, I would take all the blame even if tortured. Unless, I said, it ends up taking a long time and they don't feed me, then I'll sing like a canary. That's right, they too thought I was funny so they opened the red velvet chain to let us through and told us where to go. Even gave us a "Good Luck"! Bless their hearts. Have to say, this ball was a little fancier than our ball was. Didn't see any money-cuts there, no sir-ree. But, most were leaving from this one as well. There were people taking pictures of some famous people but I didn't know who they were. I did see a couple celebrities. I can't remember the name of the one actor, so as you can see, it made quite the impression on me...lol. Rob ran into some EOD guys that were doing Secret Service for it (no, they were not our way into the "other" ball). So that and visiting with some Wounded Warriors was one of the high-lights of his night. Very crowded, tons of people, lots of walking, standing and waiting, which, to be honest, are not my gig. The driver was on his way and I couldn't wait to get in that car and kick my heels off. Blister city. My favorite part of the night was sitting in the back seat of that sedan, while looking at all the monuments lit up and contemplating the experience we just had, having the love of my life lean over and whisper something in my ear, as we drove out of the city. I felt so blessed, for many reasons. One of which was how happy I was to be going home, my little home that makes me so happy and content, I could not wait to get in my QVC polar-fleece sheets with that man that I've had so many wonderful experiences with and watch TV with our dog. Which then made me think of my final 'home' and how that will feel when I get there. Even though I enjoyed the experience and appreciated the opportunity...there's no place like home. Doesn't it sound like so much fun! 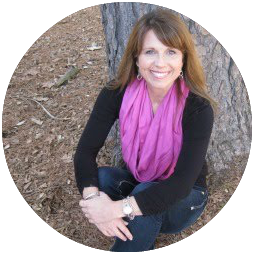 Thank you Laurie for sharing your exciting experience with us! What a cute story, and memorable experience. Thanks for sharing. that is wonderful!!! Nobody has stories like Laurie. :) And they both looked lovely. Thanks for sharing! Sounds like it was a memorable night. Love the pictures!